Well, I ordered a b&w Kindle touch. I probably can’t afford it, but I’ve been reading a lot and need something easier on my eyes. I read a LOT about the various devices and compatibility and such, and took into account all your helpful comments, thank you. In the end, I felt it would most suit my various needs, and that there are plenty of workaround programs to convert most files to show on it. Should arrive any day, can’t wait to read. 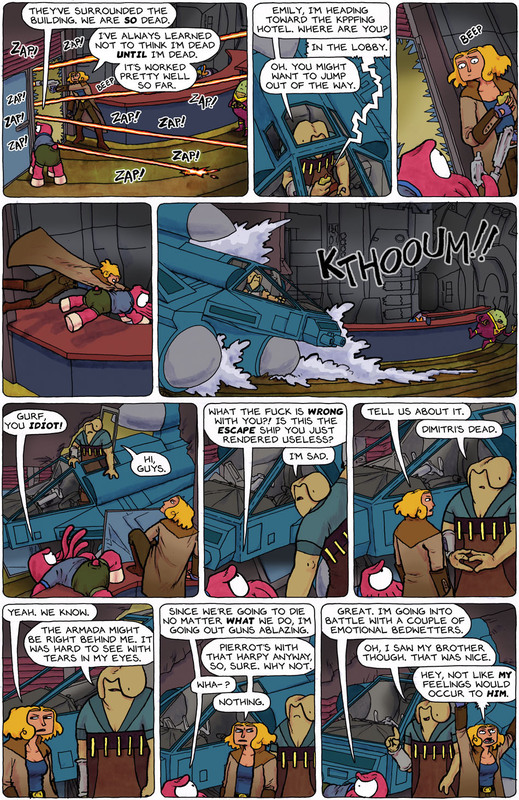 I’ve begun slowly re-reading Spacetrawler, and making notes on all the little threads and side-comments I’ve written to make sure I don’t miss anything for tying together book 3 which I’m beginning to write (currently is only vaguely outlined, as the story has taken quite a few unexpected twists and turns). HUGO Award nomination is open! The Foglio‘s (last I knew) have bowed out, which means others have a chance. I’d be in the best Graphic Story category, although I’m terrible at forms — they ask for “Any science fiction or fantasy story told in graphic form appearing for the first time in 2011” which I’m not sure if that would be Spacetrawler book#1 which appeared in print for the first time in 2011, or book#2 which began appearing on the web for the first time in 2011. Sigh. Anyhow, go there, nominate me (if you find me worthy) (even Konrad Gaertner thinks it is), and then spread the word about the strip and nominating it far and wide (please). If not me, then either Schlock Mercenary or Marooned would be acceptable I suppooooosse. Made seitan this week, as well as several batches of granola, bread, and we’ve recently been playing with growing sprouts. I do so love the kitchen. I went running for the first time in years on Sunday, inspired because a friend asked me to play racquetball, and I wanted to see if my body would hold together in one piece if moved faster than a stroll. I survived the test jog (barely), racquetball is Wednesday, the resulting wake and funeral will probably be scheduled for the weekend. This is a great fight scene, allowing that none of the fighters seems to be paying attention to fighting. When can I vote? This strip great fun and great imagination! Panel three is the best panel. 😀 Still makes me laugh like crazy. Hooray for the Gurf cavalry! Sometimes you really don’t want to see it coming over the hill! Ooh, Emily’s hating Pierrot! She must like him! Aww, she has feelings for him after all! Good for you on getting some exercise! I’ve been meaning to do the same for ages, which is of course another way of saying I’ve been putting it off. Racquetball would be great to do again…though the last time I played I ended up with a giant blister that covered, like, the entire pad of my foot. …er, not that you should let such a thing dissuade you. I hope the funeral’s well-attended. I can’t imagine that the Hugos would class the online strips that later made one book as a “story”. They might class Book 1 when it came out as one, or the whole series when it started online as one. I hope that helps a bit, but probably not… I’m good with forms, but actually seeing the rules is usually crucial. I ain’t eligible to vote on the Hugos but you’d certainly be on my list if I was. You won’t regret getting the kindle. I totally love mine. I’m not usually a fan of big corporations but I do have a lot of time for Amazon. I broke my first kindle when I took it skiing (don’t ask); and they sent me a free, brand new replacement, no questions asked, and already loaded with all my books and set up preferences etc.